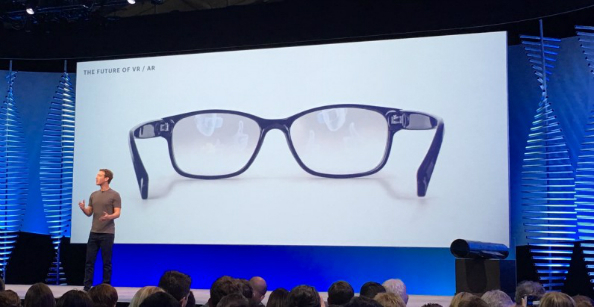 In a day bountiful with interesting presentation slides captured by blurry smartphone cameras, Facebook revealed a 10-year roadmap for their baby, Oculus Rift. Meanwhile, at the VR World Congress in Bristol, UK, research firm IHS predicted that the platform’s adoption rate will be slower over the next seven years than those of both Blu-Ray players and 3D TVs in that same span. It’s a different message from both parties than the “year or VR” hype that was bubbling away in the early part of 2016. Already ahead of the curve, with your headset sitting on your desk right now? Try the best VR games available on PC. Piers Harding-Rolls, director of IHS’s games division, emphasised that there’s huge potential in both the VR space broadly and specifically in games. While the motivation for content creators and platform holders goes well beyond simply “making VR a thing,” he said, he also revealed some striking estimates about the current user base. There will be in the region of 12-14 million adopters of VR headsets in 2016, by IHS’s calculations. However, 80% of those are, or will be, given away rather than bought. It’s an enormously high figure, which Harding-Rolls suggested will impact software sales – only those who bought their headsets are likely to go and buy additional content for it. If that sounds a bit gloomy, there’s better news when comparing 2015’s user base to 2016’s. Just 3 million adopters existed last year, so the uptake this year is dramatic. It’s to be expected, given Oculus Rift and HTC Vive’s recent launches, but stands as evidence that they’re having an impact – albeit helped along by freebies. In this story’s header image, you’ll see IHS’s predicted adoption rate for VR over the next seven years, side-by-side with uptake performance of Blu-Ray players and 3D TVs across the same span. It looks good for VR in the short term, but IHS conclude that over the span of seven years, adoption rates will be slower than both. 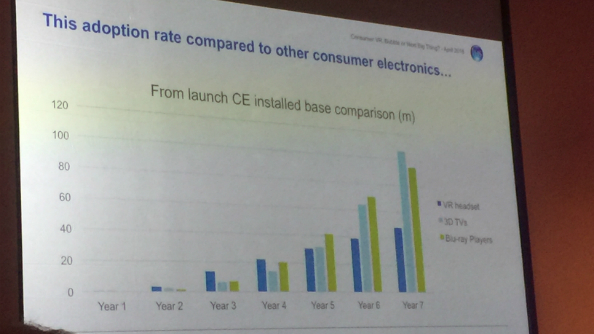 Harding-Rolls concluded that the tech simply isn’t there yet for a more rapid uptake, and that the endgame has to be a self-powered, high-end integrated display that is also cheap. Easier said than done, of course. And this is where I’ll bring in Facebook’s recent talk on VR. In it, Mark Zuckerberg laid out the company’s roadmap for Oculus. It’s also striking, for two reasons: 1) it’s ten years long, and 2) it concludes with a pair of VR Ray-Bans, essentially.